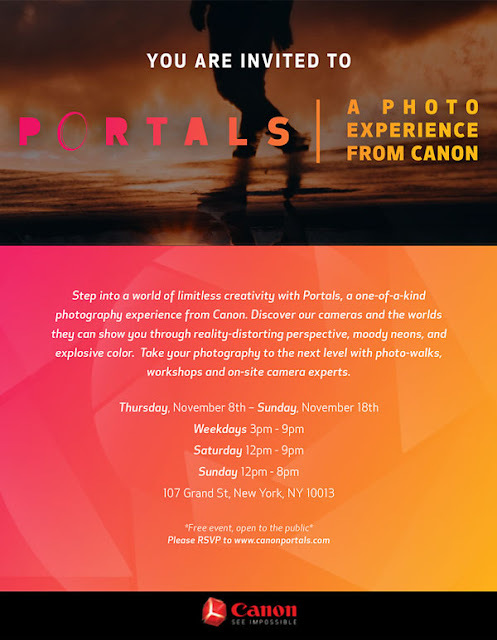 Canon is hosting PORTALS, a pop-up photo experience in NYC that ends this Sunday, November 18th, and then heads to Los Angeles. The 11-day pop-up is built around photo moments that transports visitors to an entirely new world by embedding camera tips and tricks into the consumer journey. It's made up of five unique photography setups, allowing both amateur and experienced photographers to create exciting, instagrammable photos. This pop-up experience allows guests to shoot with and get familiar with the features of Canon cameras. Check out the PORTALS website at CanonPORTALS.com for information on the photo walks and educational workshops that Canon is hosting. You can also check out the #CanonPORTALS hashtag to see what other attendees are sharing. Used the low-light and long exposure features of the Canon camera to open up a portal of light. this flying rug experience was a fun one to shoot!